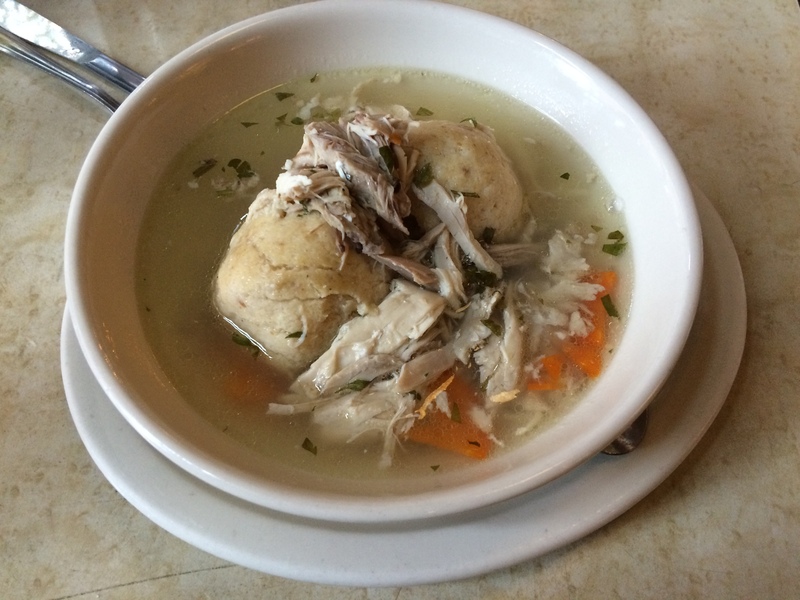 We chose six well-reviewed Manhattan matzah ball restaurants and proceeded to visit each one over the course of an afternoon. No one’s balls are as good as your grandmother’s balls. Ask any Italian where to get the best red sauce and the answer is “my grandmother.” It’s like that. Our bet was that those of us who grew up eating matzah balls would be disappointed by all of the balls because they weren’t the ones we grew up with. Dill? Salt quantity? Too oily? If you add that much fat, it better add that much flavor. Matzah balls derive a lot of their flavor from the broth they are bobbing in. For the most part, we had a lot of good broth. Only a couple places did something special. 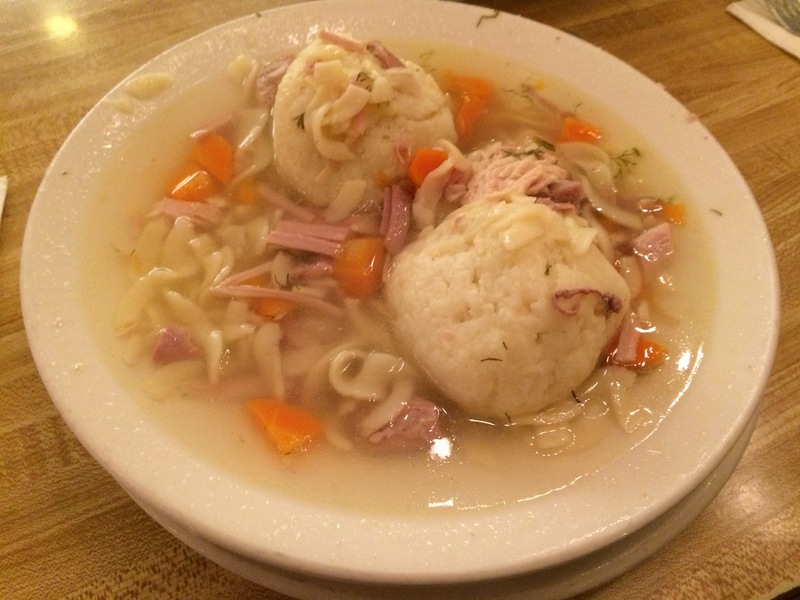 Matzah balls range from too soft to maintain their own structure in broth to very dense. A good general rule is that greater density correlates with more flavor. The larger the ball, the less flavor. If you like large, loose balls, it’s probably because you like the consistency… The way they feel in your mouth, not that good ole matzah flavor. Spongy balls don’t need to be flavorful on their own as long as they swim in winning broth. Spongy balls are pervasive. Noodles don’t add value. They usually just add mushiness. Exception: 2nd Avenue Deli, but only if little pasta squares can be considered noodles. Kashka is a good thing to add if you like your matzah balls to taste like the root of a plant. Not a root vegetable, an actual root. We both grew up with dense matzah balls. My family’s balls are so hard they’re weaponized. You just can’t get balls that are this dense in restaurants. There’s no apparent reason for it; it’s just a tragic fact of life. If you like your balls soft, squishy, crumbly, or otherwise flaccid, Blue Ribbon’s are the limpest of the bunch. Personally, I hate these kinds of balls, but I know many-a-person who’s into this sort of thing. If you like a soft ball that can still hold up under pressure, check out the 2nd Avenue Deli. We found no relationship between price and quality. We found no correlation between price and amount of food either. Price is only related to the ambiance of the establishment. But while we’re on the subject, Blue Ribbon is a little too proud of their balls. I’m not one to laugh at someone’s balls, but $15 is a joke. Why? Because Veselka’s balls are firm, like our grandmother’s balls and have a distinctive matzah-y flavor. The balls have a density and weight to them; when you handle them, you know it. They have the saltiness that you expect from balls. The broth is flavorful, with pieces of chicken. It’s served with slices of sweet challah bread, which balance the salty soup perfectly. Veselka was great, but it’s got nothing on what we make at home. Kreplach are awesome. They are the wantons of Jewish chicken soup. Restaurants usually make better kreplach than matzah balls. If a restaurant offers Kreplach or matzah balls, go with the kreplach. Next year we’re going to have to do a kreplach tour. Thanks for the review. I’m eager to try Veselka; what were the other five?